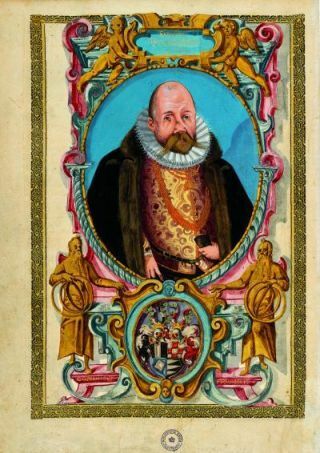 This is a watercolor of Tycho Brahe from around 1600 as he looked shortly before his death. His bushy mustache and slightly deformed nose with its prosthesis are visible. Danish astronomer Tycho Brahe made the most accurate celestial observations of his time and challenged the prevailing belief in how the universe was organized. And while most people may think of scientists as stodgy academic types, Brahe's flamboyant lifestyle and ignominious death would have made some of today's wild celebrities look like choirboys. Born in Denmark in 1546, Brahe's parents were members of nobility. He was raised by his wealthy uncle, and attended universities in Copenhagen and Leipzig. Though his family badgered him to study law, Brahe chose instead to pursue astronomy. In 1566, 20-year-old Brahe fought a fellow student in a duel over who was the better mathematician. As a result, he lost a large chunk of his nose. For the rest of his life, he donned a metal prosthetic to cover the disfigurement. Brahe died in 1601 at the age of 54. While attending a banquet, societal customs did not allow him to excuse himself before his host. Brahe had drunk excessively, but refused to leave to use the bathroom. It is thought that this caused his bladder to burst and led to his subsequent death. However, scientists who opened Brahe's grave in 1901 to mark the 300th anniversary of his death claimed to find mercury in his remains, fueling rumors that the astronomer was poisoned. Some even accused a jealous Johannes Kepler of the crime. Brahe's body was exhumed again in 2010. Tests on his bones and beard hairs showed that mercury concentrations in his body were not high enough to have killed him. "In fact, chemical analyses of the bones indicate that Tycho Brahe was not exposed to an abnormally high mercury load in the last five to ten years of his life," researcher Kaare Lund Rasmussen, an associate professor of chemistry at the University of Southern Denmark who analyzed mercury levels in Brahe's beard and bones, said in a statement. However, further research revealed that the astronomer was exposed to high levels of gold in his lifetime. "We found traces of gold in Tycho Brahe's hair, and we can establish that he was exposed to gold while these hairs were still on his body," Rasmussen said in a 2016 statement. "It may have been the cutlery and plates of gold, or maybe the wine he drank contained gold leaf. It's also possible that he concocted and consumed elixirs containing gold, or that he worked with alchemy,"
Researchers also found that greenish stains around the nasal areas of Brahe's corpse contained traces of copper and zinc, indicating that his fake nose was made of brass and not silver or gold, as many had believed. "When we exhumed the body in 2010, we took a small bone sample from the nose so that we could examine its chemical composition," project leader Jens Vellev, an archaeologist at Aarhus University in Denmark, said the same statement. "Surprisingly, our analyses revealed that the prosthesis was not made of precious metals, as was previously supposed ... So Tycho Brahe's famous 'silver nose' wasn't made of silver after all." When Brahe was born, his Danish name was Tyge Otteson Brahe. However, he adopted a Latinized form, Tycho Brahe, when he was about 15 years old. There is not much consensus about how the name is pronounced in English. Some say his first name is "tee-ko"; others say "tie-ko." His last name is pronounced either "brah," "bra-hay" or "bra-hee." He is sometimes referred to only by his first name, as in Tycho Crater on the moon, the Tycho Deep Space capsule and Tycho's Supernova Remnant. In 1572, Brahe observed a supernova in the constellation of Cassiopeia. Brighter than Venus, the new star remained visible for a year and a half. In 1577, he observed a comet. Current theory taught that both were disturbances in the atmosphere. However, Brahe's precise measurements revealed differently. He proved that the supernova never changed with regard to the surrounding stars, and that the comet orbited beyond the path of the moon, contradicting the idea that the heavens never changed. In 1575, King Frederick II sought to keep the now-famous Brahe in Denmark by offering him his own island and financial support to study astronomy. There, Brahe built an enormous observatory, where he kept meticulous observations of the heavens. While most astronomers only focused on observing heavenly bodies at specific, unusual points in their orbits, Brahe intently tracked them in their entire visible orbit across the sky, creating the most precise observations made at the time. Some of his measurements were accurate to half an arc minute, which is especially admirable given that they were all made before the advent of the telescope. Although Brahe's observations revealed the flaws of the current system, he did not embrace Nicolaus Copernicus' newly proposed sun-centered model. Instead, he offered a model that combined the two, setting the moon and sun in orbit around the Earth even as the other five known planets circled the sun. The model became popular among those who wanted to leave the older view behind but weren't ready to embrace the idea of the sun at the center of the solar system. According to Rice's University's Galileo Project, "Tycho Brahe's contributions to astronomy were enormous." In addition to his observations, he also designed and built instruments, periodically calibrating them and checking their accuracy. "He thus revolutionized astronomical instrumentation." Brahe's precise measurements laid the foundation for a new understanding of the motion of the planets. German astronomer Johannes Kepler contacted him at the end of the 16th century in an effort to obtain copies of the Danish astronomer's research. Brahe countered with a suggestion that Kepler could work as his assistant, helping him to compile his data. However, Brahe proved more tightfisted than Kepler had anticipated and refused to share his measurements of the planets and their orbits. Instead, he suggested Kepler work on solving the Mars dilemma that plagued astronomers. Because of its orbit, Mars appears to occasionally move backwards across the sky, causing many astronomers to suggest epicycles, tiny circles within their orbit. Even Copernicus' suggestion that the planets orbited the sun in circles could not account for the red planet's strange motion. Kepler, using Brahe's detailed observations, realized that the planets moved around the sun not in circles but in stretched out circles known as ellipses. However, the problem took him almost a decade to solve, and Kepler didn't publish it until well after Brahe's death. Although Brahe's family intended to reap as much financial gain as possible from Brahe's observations, Kepler, by his own admission, less-than-ethically acquired them after Tycho died.